We were then taken upstairs to the Training Room. Over to Chris the product man and three home economists – Elspeth, Annmarie and Kirsty to take it in turns and fill in the gaps. Chris is the man to keep everything lined up with Miele products and he ran through the functions, the models and the controls. He also did a great demo of the pros and cons of various induction hob designs and extractors. There was a galleried training room with a long bench and backed by banks of ovens, combination ovens and warming or sous vide drawers. Chris controlled the camera to make sure we could see what was happening with the settings at all times. We sat in pairs at the neatly laid tables with cutlery and glasses (its a tough life). Meanwhile the home economists did a fantastic job singing the praises of the steam oven vs the microwave and cooked a few dishes for us to eat. The menu was really well designed to show off the features – and tasted good too. We started with curried giant couscous from the steam oven – good tips about the water content needed to cook perfectly. We also had some lightly pickled vegetables. The warming drawer made a great job of sunblush tomatoes, peppers and chilli to make a gazpacho to accompany the white crab meat and cucumber caviar. There was some excellent bread baked in a conventional oven with steam plus and a delicious basil butter. We had sous vide chicken cooked in the full steam oven accompanied by mash and heritage carrots to show off the benefits in retaining colour in the steam oven. The steam combination cooked some beautiful madeleines to have with coffee and the conventional oven made a very tasty vanilla sponge. Throughout there were some great tips and personal anecdotes and no questions was too stupid to deserve an answer (and I tried). In between sessions/courses there was plenty of time to explore the equipment in the show room and a demo of the induction jobs in the Steam Room. This was just one of the areas where there are other more hands-on courses run during the week. All of the equipment in the show room is switched on so that you can use the controls but doesn’t heat up. What did I learn? I learned a huge amount about use of steam either in a conventional oven or in a steam combination oven – can’t wait to try it with Auntie Ruby’s Yorkshire pudding recipe. I also picked up a few features that matter in the induction hobs – broadly things that people selling kitchens won’t know or care about. It made me think about controllable temperature ranges and the opportunities for slow cooking with a good oven and the potential for sous vide cooking in the steam oven. More than anything I was expecting a cross over between conventional and steam ovens but not the degree of crossover with microwaves and the hob. Overall I think the event was excellent. I learnt so much about the different ovens and it definitely helped decide what I want. 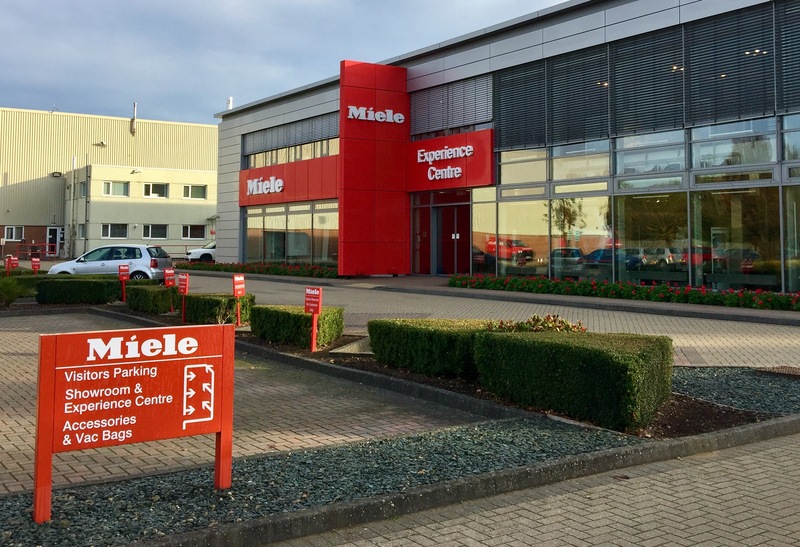 From Miele’s perspective it definitely made me want Miele but I’ve got to go away and consider the price tag compared with AEG and Neff because this is a premium brand. The whole thing cost £30 which is phenomenal value for money for 5 hours of entertainment and a good taster menu with English fizz and some wine. This entry was posted in Review and tagged @Miele_GB, abingdon, barista, couscous, demonstration kitchen, induction hob, Just Imagine, Miele, sous vide, steam oven, warming drawer. Bookmark the permalink.